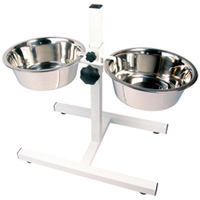 Adjustable Dog Bowl Stands are recommended by breeders and some vets, for dog breeds that are known to suffer with bloat or twisted stomach to help prevent the intake of too much air when feeding. Raised dog bowl stands are also recommended for dogs that suffer from arthritis as it allows them to feed at a more comfortable height, without placing too much pressure on joints. The adjustable dog bowl stands, manufactured by rosewood we sell online have an H' shape design to provide a stable platform from which your dog can comfortably drink or eat, with an adjustable dog bowl fastener to prevent the stainless steel bowls from turning when your dog licks the last morsels of food from the bowls in the stand. 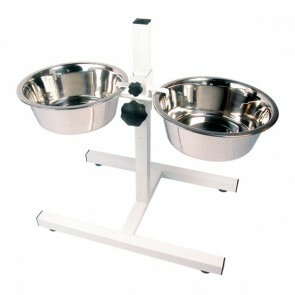 Double diner dog bowl stands allow you to offer both food and water at the same time, but most importantly allow your dog to feed from the bowls in a more relaxed posture that is upright, reducing neck and joint strain! The extra large raised adjustable dog bowl stand, manufactured by rosewood is sold including the stainless steel bowls and is suitable for any Large to Giant Breed from: Labradors, Boxers, German Shepards to Old English Mastiffs, New Foundlands, Saint Bernards & Bloodhounds! We personally would recommend to all owners with breeds that are prone to bloat or simply have a dog that bolts it's food to purchase a dog bowl stand or alternatively a set of raised dog bowls, as they are practical to use, relatively inexpensive and will help minimise the risk of bloat which unfortunately claims the lives of many dogs, if not treated quickly by a veterinarian. Bowl Stands: 5 stars out of 5 based on 2 user reviews. I have a St. Bernard and he needs to eat with his bowls raised. I am impressed with the stand. I like the fact that the bowls are included. They are a good sizes too and by the way speedy service thanks.